Jeff Jarvis is the perfect author to discuss the Google way, with his extensive background in media, from TV Guide to Entertainment Weekly to his popular blog, Buzzmachine.com. He teaches journalism at the City University of New York in NYC, and all of his background and experience combines in his analysis of Google's success. It's a fascinating, insightful examination of the company, and how it has changed the world. The Internet has changed the way the world communicates. Nothing shows that more than the last Presidential campaign in which President Obama's team capitalized on all of the ways to reach voters - from Facebook to Digg to MoveOn.org. Google, Craigslist, Facebook, Wikipedia, and Digg are all organized to take advantage of the knowledge of their users. Jarvis spends time analyzing the success of these companies that organize the modern world so people can use that knowledge, and then allow people to make suggestions, pointing out what works. Google, and the other companies discussed, can be viewed as scary, or challenging. Jarvis points out that newspapers are already on their way out because they couldn't adjust to the new way people learned the news. Jarvis examines the changes in the entertainment world and book publishing, because of these companies. And, he, and Google, share their rules, based on connections. Jarvis spends time exploring Google's rules for a new society, one "built on connections, links, transparency, openness, publicness, listening, trust, wisdom...." It's a society I'd like to live in. As a reader, and librarian, it makes me think about public libraries, and how we could change. Our biggest problem is the rules imposed on us by our governing bodies, usually city or local governments. To be honest, there would be fewer rules if librarians actually controlled their own libraries - fewer fines, fewer penalties. And, Google has already changed how libraries do business. Everyone starts with Google, looking for answers. If they succeed with books online (and they will), libraries will continue to change. With today's economy, we've seen that one of our most important roles is as an Internet access point for people needing computers to file for unemployment and find jobs. As a member of the Sunday Salon community, this book shows we've already succeeded in becoming a network to discuss the books we all love. Google, Digg, Craigslist, and the other companies are about building communities. If you came to Lesa's Book Critiques because of Sunday Salon, the network is working. And, if you go from my blog to another one, the network of book lovers is working. 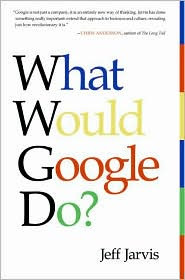 Jeff Jarvis' What Would Google Do? is a fascinating book that has already forced me to make changes on my blog. I'd like to be part of the Internet future, not the past. It's a book to read if you'd like to understand our world. What Would Google Do? by Jeff Jarvis. HarperCollins, ©2009. ISBN 9780061709715 (Hardcover), 272p. This book sounds fantastic - I will look out for it. I must admit I have never actually thought about how much the internet influences me. By and large, I only go to newspapers on line which allow response. I mostly skip the New York Times, for example, because few of their stories allow comment. I guess that shows I appreciate the ability to leave my opinion even though I know it will be buried in hundreds or thousands of others and not-much-read. I don't think some newspapers, even in their on-line incarnations, have caught on to people's desire to interact with what their reporters have written. It's a fascinating book, Scrap Girl. When you read the book, you'll realize the Internet influences you (and you, it), much more than you ever thought. I found the book hard to put down. I hadn't thought about it, Joe. But, that's probably one reason DIGG has become so popular. People can read the news stories they are interested in, comment, and interact with other people, who feel the same way they do, or disagree with them. I know I spent time every day during the election on DIGG. It's actually the same way with blogs. There have been some I've tried to comment on, but they made it too difficult if you didn't subscribe to that format to make comments. I usually didn't go back to the blog. I teach searching, and it never fails to amaze me how (as I'm sure you know also) people use [regular] google and peruse maybe 8 hits and that's it. It not only gives them not necessarily the best info but also rewards info sources that can manipulate the search hit line-up. ...not to imply this is Google's fault but I'd like to see more promulgation, even or especially from them, of better search strategies and source evaluation skills. Actually, the book didn't get into the digitizing of books and the copyright issue. I'm guessing that Jarvis addressed it at some point at Buzzmachine.com. Perhaps he didn't consider it a big enough issue at the time the book was written. I'll have to check out the article. Thanks! And, it will be interesting to see how Google changes over the years so that possibly the best sources rise to the top, not just the ones that are the most frequently used. Sounds like a must read. Knowledge is power as they say. Thanks, Kaye! I'll be over there! Thank you for the url for the NYR article! At least it's an intriguing must read. It gave me a lot to think about! The book is worth readng, Marvin. It will make you think. Thanks for the compliment about the review blog. It means a lot to me. Hope you do come back. See you on Twitter! It really is amazing how much has changed since I was a child, when computers weren't a household necessity and the internet was not quite so well known. You're welcome, Wendy. And, it's been even more for me. I remember when we all had to take notes out of books, and then we had copiers, and now computers. (Sigh) Showing my age. But, I'm happy as can be with the Google future. I will have to read this book. I have questions about the use of Google by students at school. They run to the computer without even trying to find research material in the books they have available. They are shown how to use an index and quickly forget, or just refuse to do the research. The internet is easier and more fun. This worries me, the loss of certain research skills. It worries my colleagues. Are we just stuck in another century? How do others feel about it? Rhapsodyinbooks mentioned that issue, but she was talking about teaching searching, and I don't think it was just kids in school. It's interesting to talk to some of the kids. Some of them actually understand which are the sources that can be trusted because they have to document their sources. It's our job to teach them to use databases that have put the sources online, although, as a librarian dependent on some of those sources, I will be glad when we no longer have to pay for those sources. The companies that sell databases captured librarians, and we just never had the guts to say - give us the sources, and we'll give you the users. Instead, we keep dropping databases as our economy tanks. We no longer buy the books, because we have databases, and, then we drop the databases because of the expense. I'm afraid we are stuck in another century. In talking to college students, they don't like our websites because they can't click from one database to another. They have to keep identifying themselves, so they quit using them. We need to help them find authoritative sources, and use them, until Google buys everyone out. Google, if you're listening - would you buy Gale? This book sounds very interesting. I know the Internet has changed alot of things in my life and the way I do things. It's a fascinating book, Yvonne, and I'm putting it on my list to recommend for other librarians, and patrons. Fantastic article Lesa, and it got me to read the book after you. And it worked for Marvin to, because now I have found his blog through your writing of this review. So many thanks to both of you! You're welcome, Jim. Just what I want to do - encourage other people to read the books! And, I'm glad you discovered Marvin's site as well. Thanks!